SM Study: What Did You Do When You Were Supposed to be Sleeping? What Did You Do When You Were Supposed to be Sleeping? 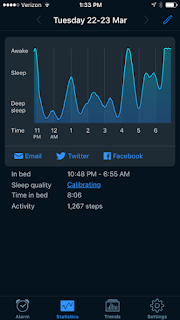 Sleep Cycle is an app that tracks your sleep cycle. Seems pretty simple, but looks can be deceiving. In November of 2015, just a few short months ago, the app was released to the public and the vote is in. Everyone loves it. So, here’s what you do. First, download the app. Before you go to sleep set the alarm programmed in the app and the sleep cycle device will activate. Place your phone screen side down on your nightstand, plug in your charger, and, hopefully, have a great night of sleep. When you wake up in the morning, the app provides you with a line graph that depicts how many hours you were in bed and how your sleep varied throughout the night from awake, sleep, and deep sleep. I tried out the app for the first time last night and it appears as if I am a champion sleeper, but I moved 1,267 times. I am a champion sleeper that thrashes. But that’s not all! 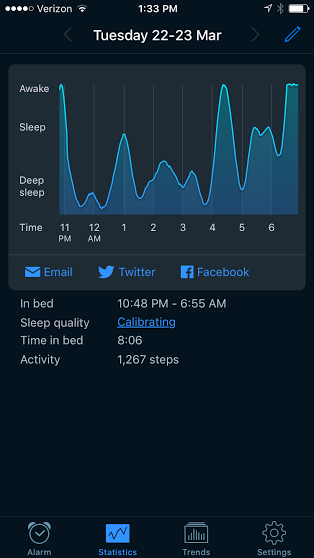 The trends tab on the app is available to premium members, and it provides you with several different charts that display sleep quality, what time you went to bed, the amount of time in bed, and what time you woke up at for the week. It also gives you a percentage in regards to sleep quality. Did you sleep poorly because you ate dinner too late? Or did you wake up refreshed because you hit the gym the day before? The app will tell you. It also lets you know if your sleep quality was affected by air pressure, weather, or if you are a thrasher like me. You get all of this information for a large fee of 83 cents a month (This is not a typo). Sales and marketing professionals can learn a thing or two from Sleep Cycle. We, as people, are fascinated about sleep. We can’t study our own sleep patterns, considering we are sleeping, so it was all too fascinating to find out that I sleep the majority of my night in a deep sleep. I would have never known that. That’s how they get us in. It’s all a marketing ploy. And then for just 83 cents a month I can not only learn how I sleep, but I will learn how I can sleep better. Who doesn’t want to know that? 83 cents a month is nothing for us fortunate enough to be living in a first world country. We see the advantages for the app, sign up, and never unsubscribe because it is only 83 cents, even though we never use the app anymore and it has been long forgotten. And the money is just rolling in for Sleep Cycle. The very popular Fitbit will track your sleep, but it can cost upwards of 200 dollars. Fitbit sold nearly 11 million devices last year, so the market was there. From looking at information that was right at their fingertips, Sleep Cycle was able to build a sales and marketing plan that was destined to succeed. I was pulled in by a marketing ploy and I didn’t even see it. That’s how you know a company is doing its job well. I look forward to going to sleep tonight, I have a competitive streak, so I want to beat last night’s amazing performance. Give it a try, you know you want to. For more information and resources about sales and marketing visit SMstudy.com. Is the Dancing Bear Threatening User Interface?